Pound chicken breasts to 1/2-inch thickness. Place flour, salt, and pepper in a shallow large bowl. Lightly dredge each chicken breast in flour, coating both sides. Heat olive o il and butter in a large saute pan over medium-high heat until it shimmers but does not smoke. Add the chicken in batches, making sure to not overcrowd the pan. Saute until golden brown, about 4-5 minutes per side. Add more oil and butter as needed. Remove chicken and set aside. Deglaze pan with wine . 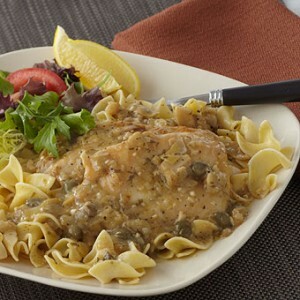 Return chicken to pan and add Artichoke Piccata Simmering Sauce. Cover pan with lid and simmer 15 minutes. Serve over cooked pasta. *Sold in our Gourmet Department.